What colors do Pomeranians come in? 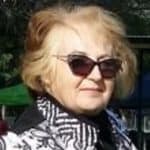 Detailed information on the many different colors and many Pomeranian dog photos. It is important to understand the different Pomeranian colors. Learn all about toy Pom colors. What colors can Pomeranians be? Pictures of Pomeranian puppy colors, Pomeranian all colors and a Pomeranian colors chart. To clarify one element mentioned throughout; “Points” refers to: the Pom’s rims of the eyes, lips, nose and pads of the feet. A Beaver Pomeranian is a dilute brown. The beaver coat can range from orange-brown to beige-cream. Beavers are a deep taupe color with a silvery blue cast to the coat tips. In older versions of the Breed Standard, this color was called “biscuit.” One stand-out feature is the pigment on the points and it’s a self-colored brown/beige colour. 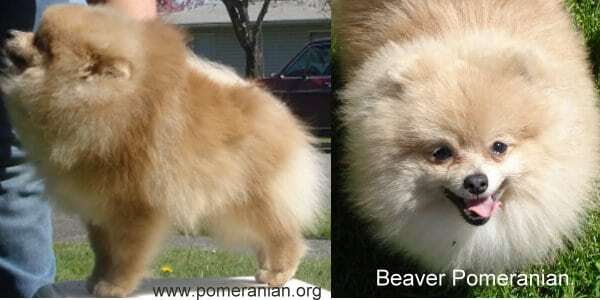 A beaver color Pomeranian usually will have hazel eyes. If a dog has black points or black in his coat, he’s not Pomeranian beaver or brown. A Blue in the Pomeranian is a solid color. A blue Pomeranian dog will have light to dark grey guard hairs and a grey undercoat with a greyish blue hair or fur. 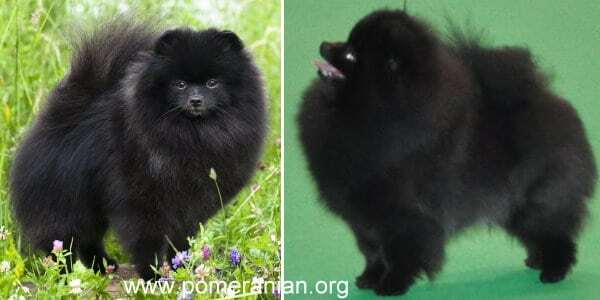 Some Blue Poms can be such a dark shade of blue, that may look black in certain light. Compare these dogs to a genuine example of the colors. At birth, Blue Pomeranian puppies are usually a silver color. Some newborn blue’s may even appear to be black. Blue Pomeranian pups develop a silver/grey undercoat and a darker slate grey outer coat as they mature. Pomeranian blue are a diluted black and must have blue points (Eye rims, nose and pads ). 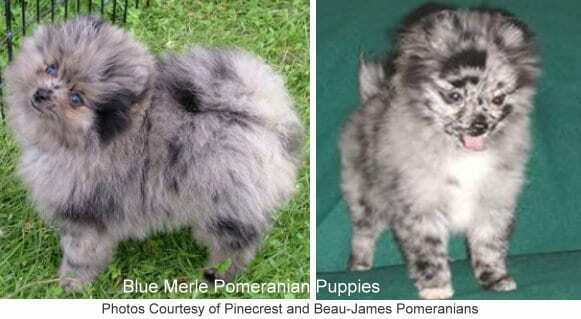 Blue Poms are usually the result of breeding blacks together. In the event the coat is made up of any kind of additional colors the dog is appropriately termed as a parti-color, or tri-color Pomeranian. In Pomeranian dog colors, Brown is a very diverse color and ranges from the light beaver shade through to the darkest chocolate shade. 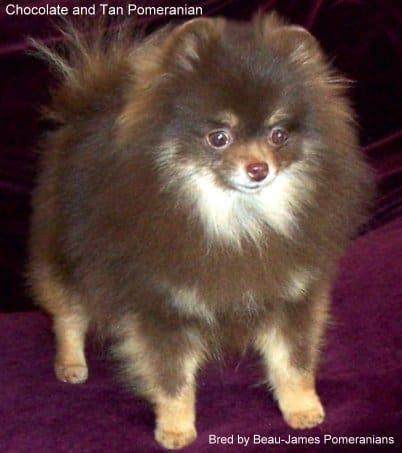 The chocolate Pomeranian color is rich and is fully self-coloured. Brown is more of a milk chocolate color and may sometimes have lighter shades. “Sunburning” or a reddening of the color can occur if the dog spends a lot of time outside. A Pomeranian Brown must have brown points and will, like the beaver often have hazel eyes. 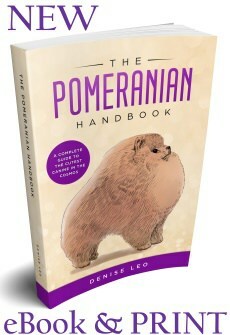 For more information on the Brown Pomeranian. 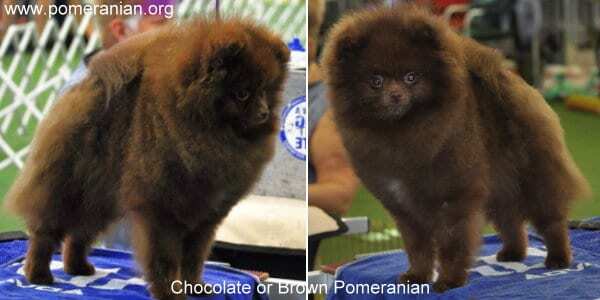 Pictures of Chocolate Pomeranian puppies and Brown Pomeranian Adults Click Here. 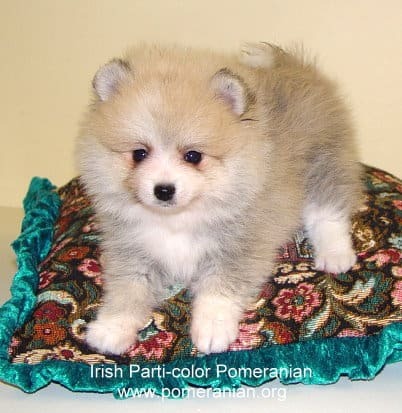 This Pomeranian color should be self-colored, with no white breechings. Because of the harsher texture of the guard hairs, the top coat may appear darker. 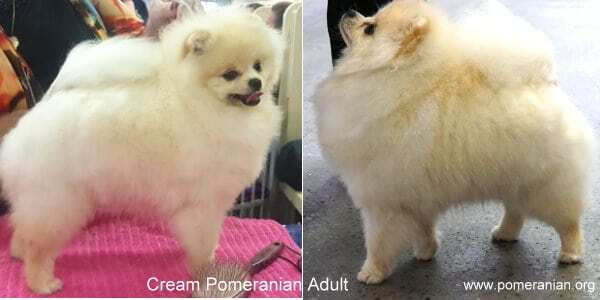 A cream Pomeranian must possess black eye rims, nose, lips and pads. A cream colored Pomeranian puppy istypically white at birth. The Lavender Pomeranian color is greyish with a pinkish, chocolate hue to the coat. The Pomeranian Lavender is regarded as a rare Pomeranian color. If you think of a grey colored Pom and add a small tinge of light purple, you’ll have this amazing color. 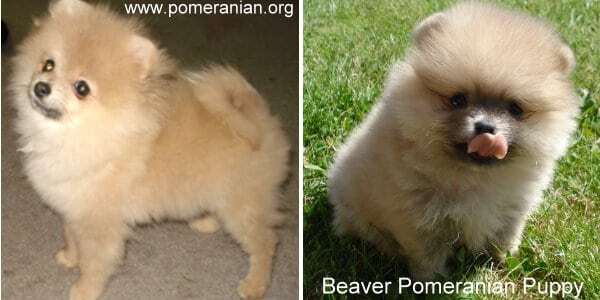 Lavender Pomeranians are often the result of breeding two dilutes, like a blue and a beaver together. 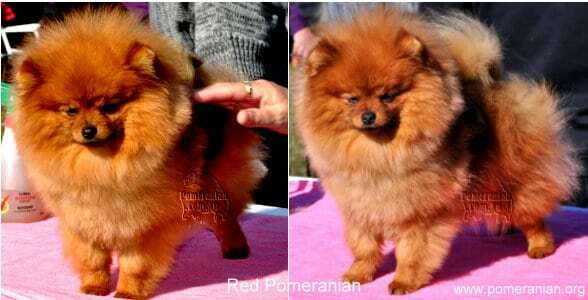 Note this beautiful color is currently not AKC Pomeranian breed standard approved. 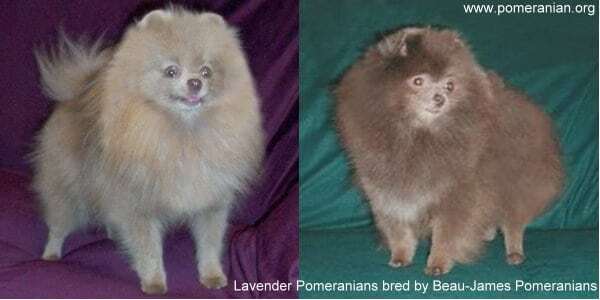 Lavender Pomeranians bred by Beau James Pomeranians. There are more than one type of Orange Pomeranian dog. Oranges can be born a sable color, or a light orange Pomeranian, or even appear white as a newborn. An Orange Puppy can be born a darkish sable. This pup will frequently clear to be a lovely orange Pom dog at maturity. Another type of orange Pomeranian dog is born very pale and, in some instances, almost as white as a new-born. The coat colour with this type of orange will deepen until, at maturity, this Orange Pomeranian puppy is also a beautiful orange. Breed Standards dictate that an Orange Pom must have black points the same as the red pom. An adult orange pom (phenotype) can be two genetic types (genotypes). 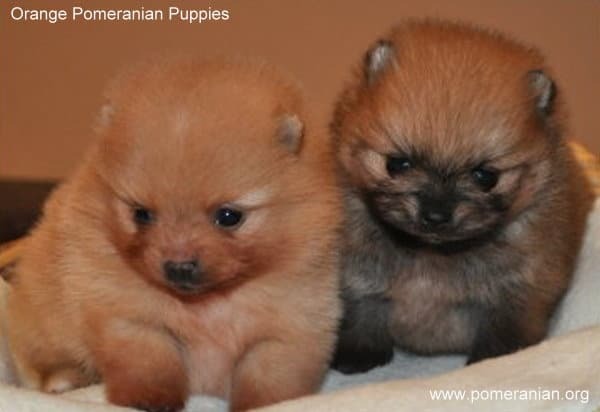 The colour of new Pomeranian puppies will show the genetic difference. When an orange Pomeranian puppy is born, he usually has sable hair and the coat will slowly lighten and become an orange in colour as he ages. This type of Pomeranian puppy often turns out a bright orange colour. 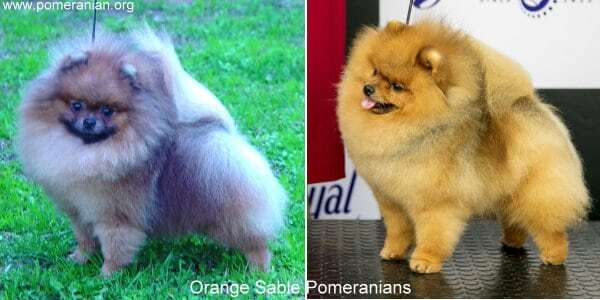 If the sable shadings do not fade, as an adult this would be an Sable Orange Pomeranian. Pet Pom owners often refer to Pomeranian colors tan being really an Orange. In some cases, he’s born with no black hairs and is a clear bright colour at birth. The cause of this is puppy being homozygous for the orange gene. (Both of the genes at the locus have the allele for orange “ee.”) Homozygous orange poms can still range from being as dark as the red setter right through to the palest creamy-orange pom. The points on the lighter coloured oranges may not be as dark as the poms with the sable gene. Pet owners often erroneously refer to these colored dogs as tan Pomeranians. A red Pomeranian is a deep rusty red color and his points must be black. 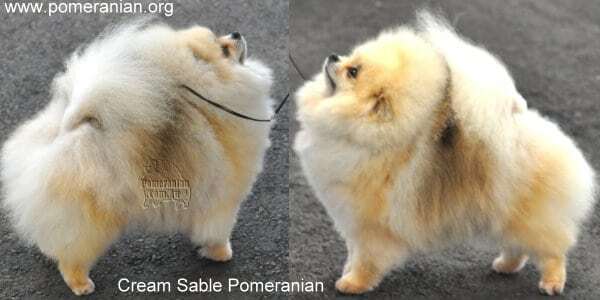 Details of sable Pomeranian colors and sable color Pomeranian photos. One of the most popular Pomeranian orange sable A Pomeranians with a sable coat have at least three colors shaded along the coat. This shading must be as consistent as is possible with no areas of self-color. Have black tips and red hues. Have deep orange guard hairs with black tips and the undercoat is cream or light orange in color. 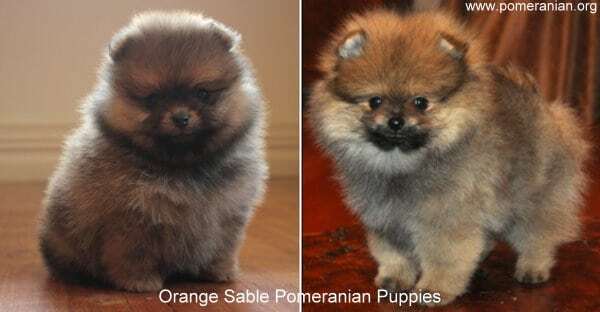 An orange sable Pomeranian puppy is usually very dark at birth. 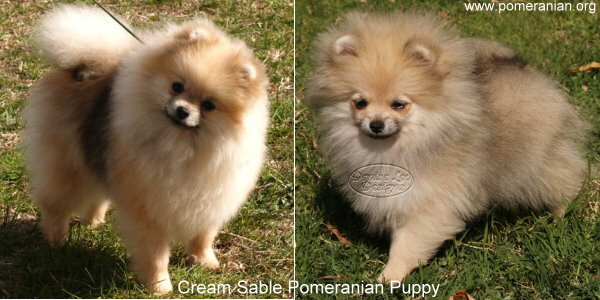 Are creams with sable tipping to the guard hairs. Sable colours won’t always show correctly in photos. Instead, the dog may look even a black or blue. You need to see the dog in person to experience the rich colours. 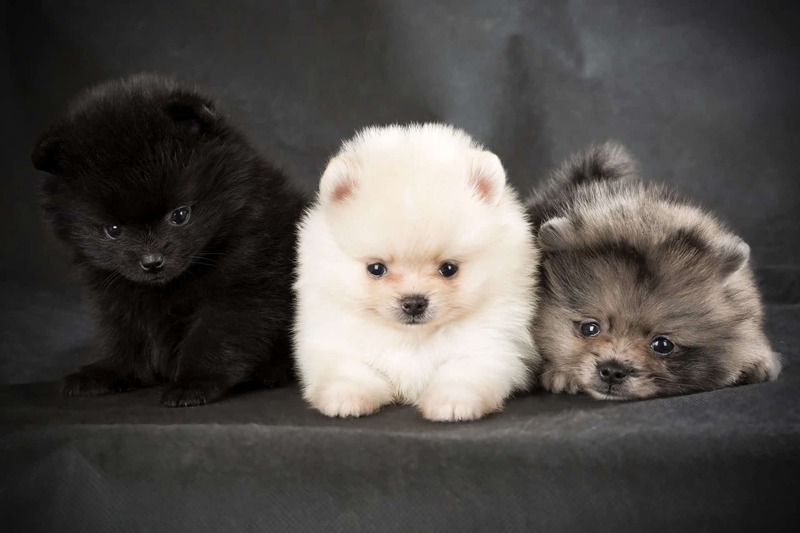 Wolf Sable Pomeranians have a grey undercoat and the guard hair is grey with black tipping. The Pomeranian grey undercoat and guard hairs can vary in colour from silvery off- white to a light grey. The wolf sable Pomeranian colors grey-shaded and must not have any hint of orange in his coat. 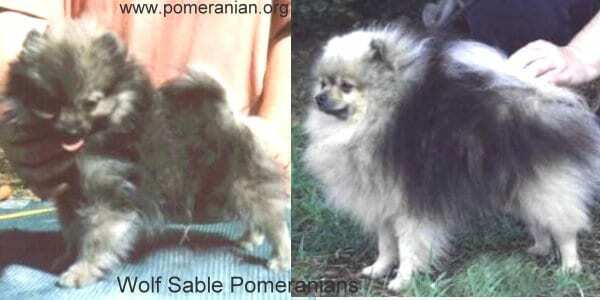 Beginner breeders sometimes mistakenly register a gray Pomeranian puppy as a wolf sable. Orange sable puppies often appear more grey than orange at six weeks. However, as they mature, the orange comes through. Experienced breeders know to check behind the ears. The actual color of the hair behind a puppy’s ears is a reasonably accurate guide to the Pomeranian puppy’s adult coat colour. Chocolate Sable Pomeranians have a chocolate base coat with darker chocolate guard hairs ending with tipping to the guard hairs. 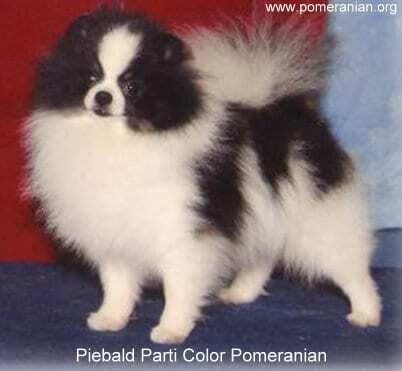 Blue Sable Pomeranians are blue base coat with dark blue guard hairs and again ending in tipping to the guard hairs. 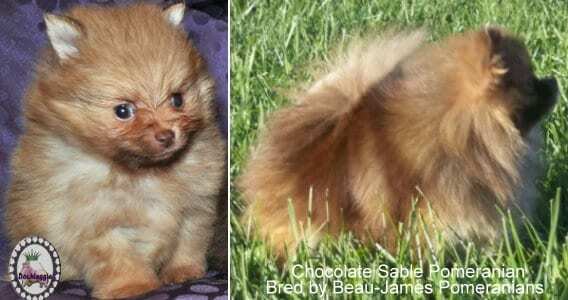 Chocolate Sable Pomeranian Puppy bred by Dochlaggie Pomeranians. 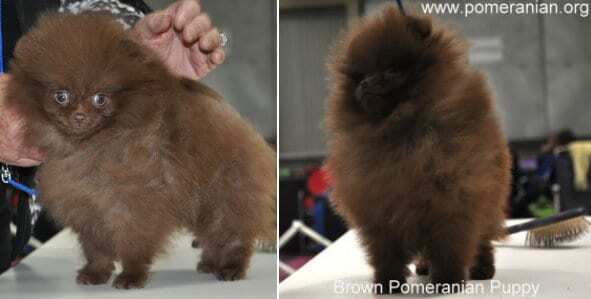 Chocolate Sable Pomeranian Adult. Breeder Cynthia Wallen, Beau James Pomeranians. A White Pomeranian, as a newborn Pom puppy is snow white in color with pink points. As the puppy ages the points should darken to black. All all white Pomeranian should be a solid white color, free from any lemon or cream shadings. 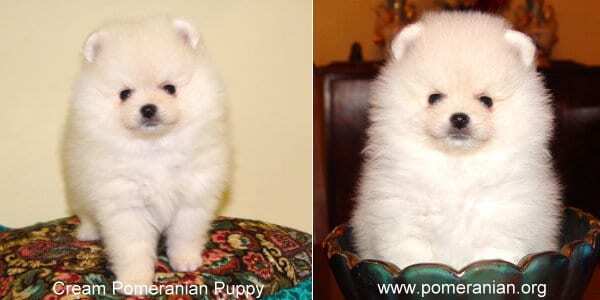 Click here for more information and pictures of white Pomeranian adults and white Pomeranian puppies. 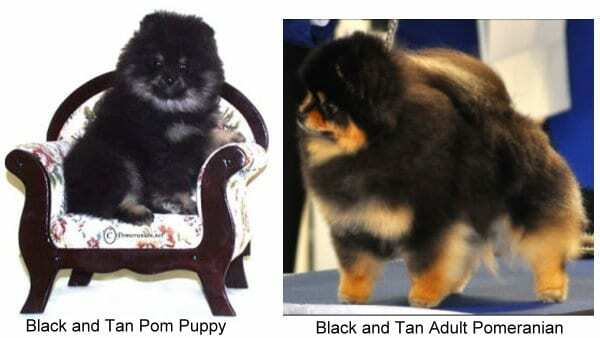 Pomeranians with tan points appear in three foundation colours: Blue and Tan Pomeranians, Brown and Tan Pomeranians and Black and Tan Pomeranian. The three colours share the same tan marking pattern. Any solid colour or allowed pattern with tan or rust sharply defined, appearing above each eye and on muzzle, throat, and fore chest, on all legs and feet and below the tail. The richer the tan the more desirable. Tan markings should be readily visible. 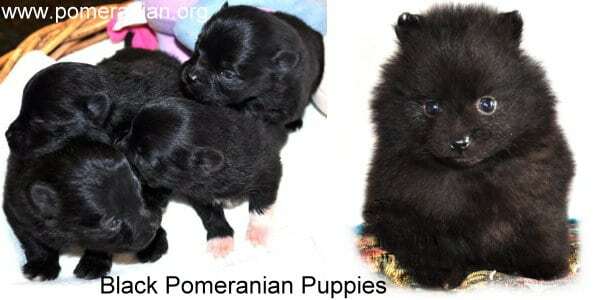 As the name suggests, these are black colored Pomeranians with rust or tan marking. The undercoat’s base color will be lighter than the main colour and points will be black. If you have two dogs of the same quality, the rusty darker color is the preferred option. This is generally called Chocolate & Tan and it covers all shades from the pale beaver with rust or tan right through to the darkest chocolate. The points will be brown and the shade will match that of the coat. 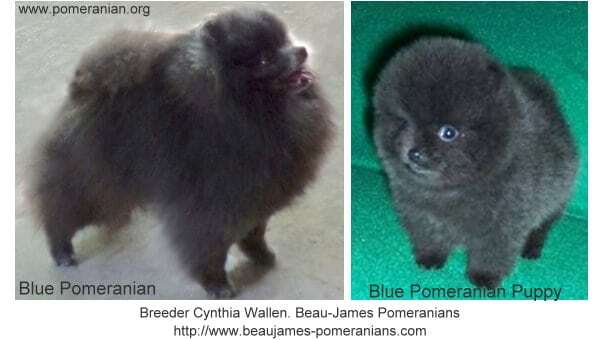 Breeder Cynthia Wallen, Beau James Pomeranians. These poms have rust or tan and a blue colour. The points will be blue and match the coat’s shade. Brindle is a pattern that has a base colour and striped overlays. The colour of the base can be: red, gold or orange and the brindle colour is strong black stripes. It may also be combined with other patterns on a dog’s coat; for example, black and tan or parti. The points should match the base colour. Stripes may be thin or broad and may only appear on parts of the dog’s body or the entire width. Stripes on adult brindle Pom coats may appear to be broken owing to the length of an adult Pom’s coat. Brindles often have an extremely dark dorsal stripe. Adult Pomeranian is Beau James Stripe Up The Band. 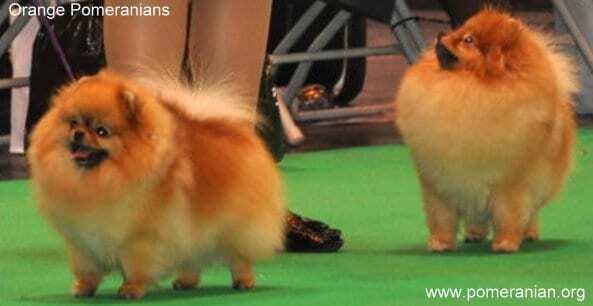 Breeder Cynthia Wallen, Beau James Pomeranians. 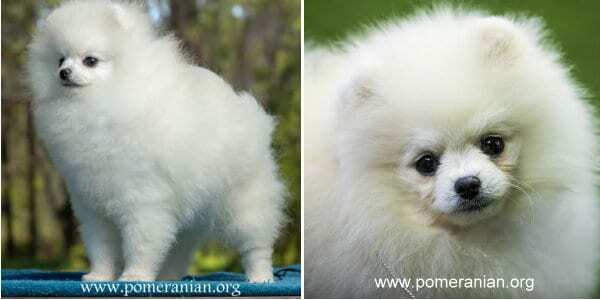 Parti-color Pomeranians are white with any other colour distributed in patches with a white blaze preferred on the head. Markings on the head should be symmetrical. Excessive ticking is regarded as a fault. The points on parti-colored poms should match the colour of the patches. This means black, red, cream, orange, brindle parti poms, blue and red merle and sable colours should have black points. Blue sable and blue must have blue points. Brown merle, brown and beaver must have brown coloured points. Parti colored Pomeranians seem to be the most intelligent, outgoing and active members of the Pomeranian dog world. If you have owned a parti-color Pomeranian you will never want any another color Pom dog to share your life. I probably should have reworded that statement to read; if you have ever been owned by a parti Pom. White with patches of color on head and base of tail. The piebald Pomeranian is white with patches of color on head, body, and base of tail. 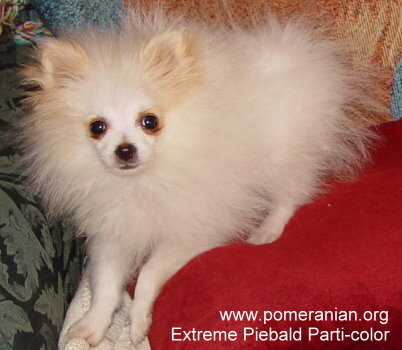 This Pomeranian parti has color on the head and body with white legs, chest and collar. Is actually the typical gray/black pattern. 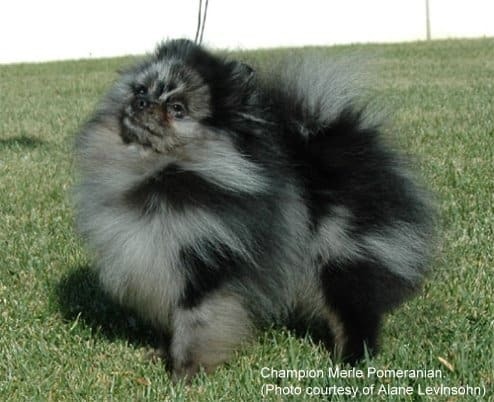 The blue merle Pomeranian is in reality a black or black and tan with the dilution gene affecting the black coat regions.The color of the points in the merle Pomeranians is influenced by the base color e.g. Orange merles, blue merles should have black points . Beaver, blue, and brown merle Pomeranians should have self colored points. The Pom Breed Standard does not permit blue eyes. & Tan Parti-Color. A colour that is named an “& tan” has the “& tan” pattern and also the parti-colored pattern (i.e. a tan-pointed parti). E.g. a Tri Colored Black & Tan parti color Pomeranian. Again the color of the points should match the color of the parti-colored coat patches. The Open Classes at specialty shows may be divided by color as follows: Open Red, Orange, Cream, and Sable; Open Black, Brown, and Blue; Open Any Other Color, Pattern, or Variation. Official Standard of the Pomeranian (AKC). American Kennel Club, 2011. English Kennel Club Pomeranian Breed Standard , 2017. Colors of a Pomeranian Note: Pictures of Pomeranian fur colors are required for this Pomeranian website. Pomeranian different colors are needed. 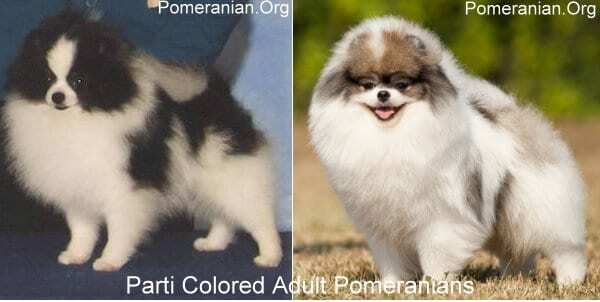 If you are able to provide any of the rare colored Pomeranian pictures please contact via the site contact form. Pom colors required are examples of blue & tans, lilac Pomeranian, chocolate and tans, blues, blue sables, another adult merle, red sables, parti Pomeranian, irish parti-color and some of the rare Pomeranian colors are required. Dogs and owners will be acknowledged as required. 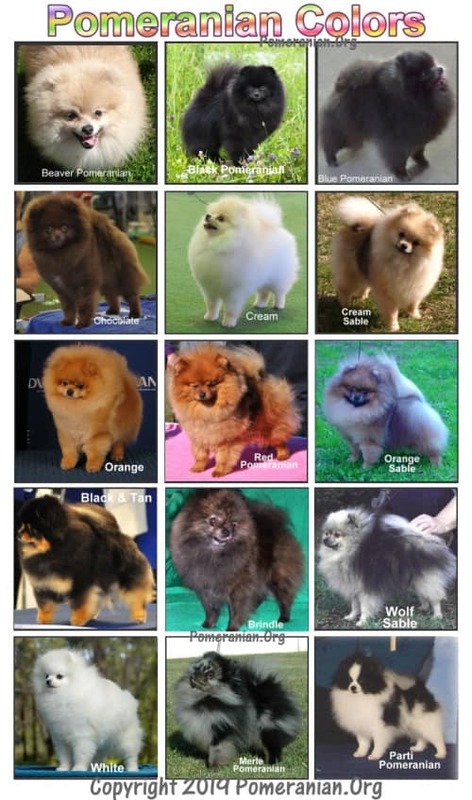 Thanks to all those who have helped with this education project on Pomeranian coat colours .